Water is one of the most universal components of life. It is necessary to keep our bodies alive and healthy. Various physiological processes require water, and it makes up over 70 percent of our anatomy. We drink it, but we also bathe with it and use it for cooking and cleaning. Everyday appliances like dishwashers and washing machines depend on it to work. So what could be more important than having fresh, clean, healthy water available in our homes and workplaces? There are several ways to ensure that you have access to safe water for drinking and other practical, daily uses. One option is a water cooler — such as a bottleless water cooler — which are environmentally friendly, efficient and affordable. Another dependable and comprehensive option to providing access to fresh, clean water is a water filter system. A water filter system can be installed at the counter top level, under the sink or even for your whole house or place of business. Water consists of two elements, hydrogen and oxygen, which make up a molecule of water. There are two hydrogen atoms and one oxygen atom, which are held together by strong covalent bonds, resulting in the chemical formula H2O. A glass of water is a collection of many of these molecules. Water can obviously be found in different forms depending on the temperature — in addition to liquid form, there is gas and solid. Water is colorless and odorless, though it may appear off-color or acquire odors when contaminated with bacteria or other dangerous substances. Although generally safe to drink and use, hard water can cause a variety of problems related to cleaning and appliance use. Hard water can create problems that include stains or soapy buildup on textiles or surfaces or buildup of mineral scale in water heaters or boilers, as well as in sinks and shower areas. Easier Cleaning: Avoid spots, streaks and soapy residue on laundry and dishes with water softening, which helps rinse soap more thoroughly. You’ll also use less soap and need to clean your bath, shower and sink less. Your hair and skin will also look and feel softer and cleaner to boot! Extended Appliance Life: Hard water contains minerals that can build up on the interior of appliances, decreasing their efficiency and causes wear and tear. Water-softening systems help extend the life of appliances that use water, such as washing machines, dishwashers, and water heaters. This saves you money and helps protect the environment since your appliances will run on less energy and need to be replaced less often. Faster Water Heating: Your hot water heaters will heat softened water more quickly, resulting in improved efficiency, reduced energy consumption, and lower utility bills. That saves money. Cleaner Plumbing System: Mineral-laden hard water results in the formation of scaly deposits inside and around plumbing fixtures and pipes. Over time, these deposits build up, causing clogs and corrosion, which can decrease the life of your plumbing parts and system and hinder the performance of your fixtures. Water softeners remove or dilute the mineral concentrations in hard water and alleviate problems associated with buildup. There are different levels of water hardness removal, depending on the composition of your water. Quality water filter systems will likely have hardness removal options of 30,000 grains, 45,000 grains or 60,000 grains. Hard water elements can be unpleasant, inconvenient and costly, but rarely are they dangerous. But other water problems can be harmful to the health, either in the short- or long-term. Humans, of course, need water to survive and its importance cannot be overstated. However, in some cases, hydrating, life-giving water can also be a source of disease when it becomes contaminated with microbes and toxic substances. That makes it important to ensure that your drinking water is free from impurities and contaminants. If the water you are drinking has toxic elements, instead of supporting your health, the chemicals and pollutants may be causing problems or creating risks. Stories of problems with tap water around the country demonstrate the very real risks. There was, of course, the infamous situation of Flint, Mich., where lead leached into the local water supply, causing rashes and worse health problems for area residents. The residents of two towns in Missouri in recent years had issues with water quality — when a water tower wasn’t cleaned in 17 years and another in which pigeon excrement contaminated the water and caused fatalities and gastrointestinal illnesses, according to a Fox news report. Perfluorinated chemicals — or PFCs — are another potentially dangerous contaminant to the water supply. PFCs are manufactured chemical compounds that make common household products more resistant to stains, grease, and water. In June 2017 the Environmental Working Group and Northeastern University published data about the extent of PFC contamination in tap water supplies. Their research found that the chemical affects the drinking water of 15 million Americans in 27 states. The PFCs originate from more than four dozen industrial and military sources from Maine to California. No federal regulations require municipalities to maintain water supplies with PFCs below a certain level. The EPA issued a non-binding health advisory level, but many experts think it’s still too high. Like many other potentially harmful organic chemicals, as well as protozoa, bacteria, and viruses, PFCs can be easily removed from the water in your home with a water filtration system. You may also be interested in how to deal with fluoride or chlorine in tap water. Municipal water suppliers add chlorine to drinking water to keep disease-causing organisms, or pathogens, from contaminating the water supply. It does protect people from water-borne diseases but can react with other naturally-occurring elements to form toxins called trihalomethanes (THMs). THMs have been linked to a wide range of health conditions, including asthma, eczema, bladder cancer and heart disease. Pregnant women who consume a high volume of chlorinated tap water can be at a higher risk of miscarriage, according to some studies. Different water filter types in systems — including point of entry, faucet of refrigerator dispenser can help remove chlorine. 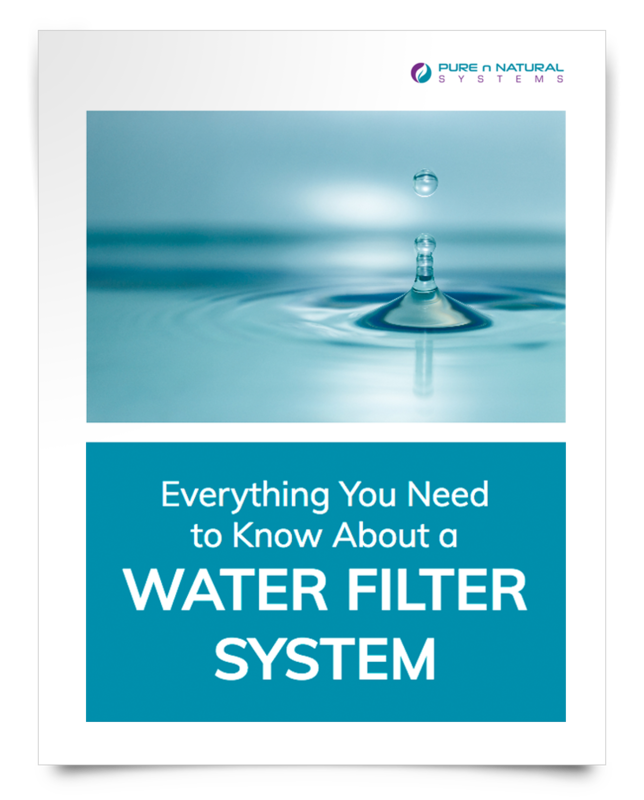 Water filter systems are fast becoming almost an essential requirement for homes and businesses, given ongoing issues with pollution and the many unknown factors that could be affecting your water — and your health. Not only can a water filter system remove harmful elements from your water, but also unpleasant tastes and odors, which are especially important for drinking water. No one wants to pour a refreshing glass of water on a hot day, only to find it tastes like algae, earth or fish! Point of entry and whole house systems offer a comprehensive solution. Systems that include water softeners specifically help manage hard water issues. A gravity fed system would likely be used only for camping, travel or emergency situations. Water filters and filtration systems are easy to maintain and provide pure, clean drinking water at virtually any tap of your home or office — and even on the road. They have the added benefit of bypassing the environmental hazards and health issues — not to mention costs — associated with buying bottled water. Different water filtration methods can be used to remove impurities from water and purify it, and each method has pros and cons. The following are some of the most commonly used types of water filtration methods for the home and office. Reverse osmosis systems are highly versatile and based on a naturally occurring process. They offer a great solution for removing fluoride, dissolved salts, sodium, and bacteria. The tiny pores of the semipermeable membrane within a reverse osmosis water purification system are small enough to prevent the majority of bacteria from passing through it — they can remove 95 percent of dissolved contaminants from the water. After prolonged use, the filters do lose effectiveness and require replacing. They produce a high quality of water, but they can be costlier than other methods of water filtration. Activated carbon water filter systems work by binding toxins in the water. By absorbing contaminants, it normally helps to purify water. These filters are normally suitable for removing chlorine and other chemicals from water. Activated carbon filters are normally combined with other water filtration techniques in order to improve the purity of water. Activated carbon filters have a long life, with some only requiring yearly replacement. UV sterilization is one of the most effective methods of purifying water and destroying bacteria and microbes. These filters normally destroy the bacteria, viruses, and protozoa that might be present in your water, making it more suitable for drinking. Solar powered filters normally operate with the help of natural energy from the sun. This energy is trapped using solar panels and then converted to usable energy making these purifiers ideal for outdoor activities such as camping. Maintenance of many solar powered water filters is a breeze, as they do not require batteries. In addition, these filters do not typically require heavy cleaning; they are eco-friendly and require only sunlight. It is important to note that few water filters effectively remove fluoride from the water, and those refrigerator filter systems made by companies like Brita filters and relying on activated carbon filters do not remove any fluoride, as evidenced via a simple total dissolved solids (TDS) test. A TDS meter is a small hand-held device that measures the conductivity of your water, which will be increased with the presence of dissolved ionized solids like salts and minerals. The capacity of water filter systems vary. A quality, durable and effective product can range from 4,000 gallons through 1 million gallons. The flow rate of a system will likely be measured in gallons of water per minute. Specifications will range from about a half gallon per minute to nearly 20 gallons per minute. The higher flow rates would be associated with systems used for the whole house. A system that measures in gallons per day would likely be used for camping or emergency situations. Given the wide range of sizes and features, the cost is anywhere from less than $100 to more than $2,100 for a water filter system, depending on whether you are targeting one tap or your whole house or business. On the low end of the cost spectrum, you can purchase a water filter that attaches to your ice maker, ensuring that even your ice cubes are safe and healthy. Under-the-counter water filter systems will cost you in the ballpark of $70 to $400. That includes those that filter refrigerator water. Whole house or point of entry systems naturally cost more, ranging from about $950 to $2,100. These can include water softening systems that target hard water supplies. Follow the manufacturer’s instructions for maintaining the system, including cleaning and changing filters in a timely fashion. An experienced indoor environmental solutions expert can help you shop for the water filter system that best meets your needs and sort through the options. They should also be able to help provide the filters and other replacement products you need to keep your system running — and your water and health safe. Contact Pure n Natural for a free water filter systems consultation for your home or business and shop our online water filter system products catalog.